Salmon is great to combine with strong flavours. Its own taste is so strong and unique but blends in perfectly with all kinds of herbs and spices, even exotic curry mixtures. 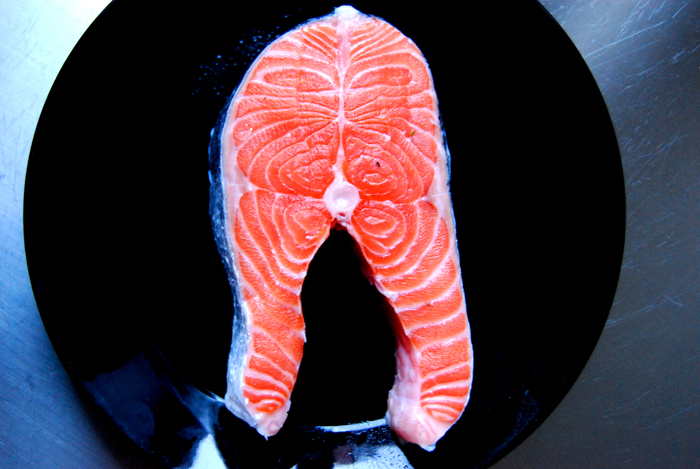 When I saw this nice salmon steak at the fish counter I had to buy it. I didn’t even plan to cook fish but it looked too good to pass by. At the moment, I use a lot of juniper, bay leaves and cloves, the typical winter spices. I decided to give them a try on the salmon as well – as a rough crust. They are very strong and aromatic spices, a bit sweet and smoky. It was more an experiment of sorts but I was really impressed by the result. We ate it with fresh bread and a salad on the side. Enjoy a glass of white wine with your meal and you will have a small dose of summer in January! Grind all the ingredients for the crust in a mortar until you have a combined paste. Heat some oil in a non-stick pan (highest temperature). Rinse and dry the fish, season with salt and pepper and fry for 1 minute (on each side). Take the fish off the heat and spread the paste on the top side of the steak. 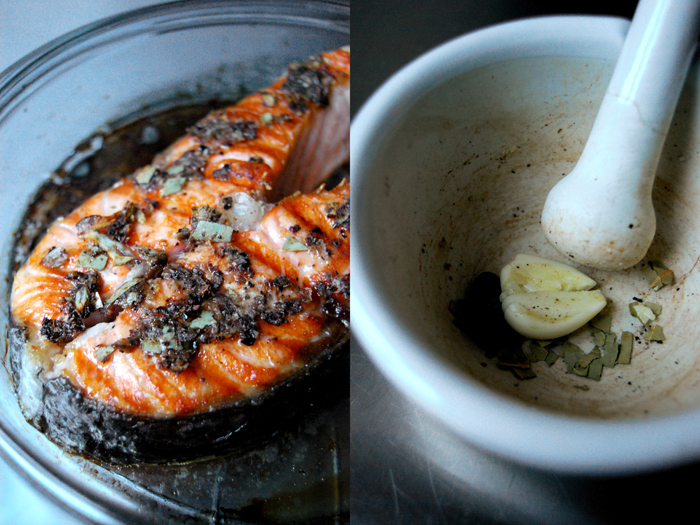 Pour a bit of oil in a baking dish, mix with the lemon juice and place your salmon steak on top. Bake in the oven for 8 minutes, when you can lift the fish from the bones it’s done.